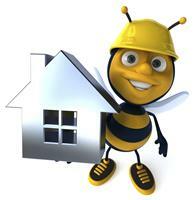 Always Bee Building - Builder, Plasterer based in Glazebury, Cheshire. Myself and all my team are time served tradesmen, giving you piece of mind that your job will be carried out to a very high standard, as quickly as possible without cutting corners. Over the years we have carried out thousands of small jobs like fitting a new front door to building a full house from scratch. We love our work and want our customers to love what we do . Our latest job was a timber framed extension over a garage, insulated and rendered ....It Looks Stunning but the best thing about it the customer said "It Was Exactly How He Wanted It"
Another client that loved what we did bought a conservatory off ebay and we built the extension using our knowledge of the industry (he had no plans) ... We created something special for him. I could talk all day about our work because of my passion for building and creating magnificent buildings, however the real proof is our customer satisfaction and you will be given contact numbers of our clients so you can have a chat with them giving you piece of mind. We not only build full extensions...we also offer a full range of other building services like: restoration work on old properties, pointing, plastering, hanging doors, replacement Windows, drains, in-printed concrete driveways, flagging, fencing, brick work, block work and stonework. So If you are looking for a quality builder to give you a fair detailed quote for your project, why not give us a call and lets see if we can help each other.